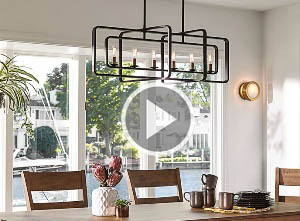 A new video from Hinkley Lighting features trendy industrial lighting. Old and new combine for the sophisticated, modern look of today's popular industrial-style fixtures. TOP TRENDS: Show style and creativity in any type of space. Industrial-style fixtures can make a statement in any decor. With equal parts vintage and modern, this trendy look is synonymous with charming character. By using a variety of materials, shapes and styles, industrial-style fixtures allow for immense creativity in decorating. Hand crafted to look as if they could have come from an early 20th-century factory or warehouse, industrial-style fixtures bring together rustic materials such as wire mesh, steel and wood to make a personal statement. Adding to the multitude of uses and locales for these unusual fixtures, is their ability to assimilate to both indoor and outdoor settings. See the latest industrial styles at your local ALA-member lighting showroom. What are the current trends in table lamps? -Peg S.
Today there are many different trends in table and floor lamps. Perhaps the most predominant trend is proliferation of a huge variety of new styles and designs now available on the market. One of the most notable trends is the use of new LED lighting that is a permanent part of many table and floor lamps. In this type of lamp there is no light bulb in the traditional sense. The LED lighting element is actually a permanent part of the lamp. The extremely long life and high energy efficiency of LED lighting makes this innovation possible. By making the LED a permanent part of the lamp, it is possible to create innovative and versatile shapes and forms that are quite different form more traditional lamps. Submit your questions here for an ALA-trained lighting professional. GO-TO GUIDE: ALA offers complimentary copies of Lighting. Whether you already have an idea in mind of how you want your home to look, or if your design scheme is a blank slate, Lighting magazine is the perfect place to find inspiration. Produced by Better Homes & Gardens, Lighting magazine is full of pictures of beautiful home settings featuring the latest lighting and design trends that you can easily incorporate into your home for a whole new look. To get your free copy of Lighting magazine, click here. View a digital copy ofLightinghere.